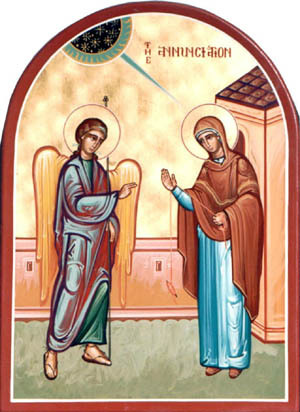 This past Sunday, the last before Christmas, we heard the story of the Annunciation from Luke’s Gospel. You know, the story about how the Archangel Gabriel appears to the young Mary, asking if she will be the mother of Jesus. It’s a story that makes a lot of people uncomfortable in part because many modern people consider the whole notion of angels showing up and announcing things to be rather fanciful, and in part because it gets us into that whole virgin birth thing which seems to many people even more unlikely than an angel showing up. This deceptively simple answer contains an entire theological world within it. The God who is revealed in Mary’s response is a God who does not force people to do his will like some petty dictator. Rather, it is a God who invites, who initiates a relationship and makes a request. It is a God who seeks to partner with a human being in order to bring about something important. And the human being who is revealed in Mary’s response is not someone who stands impotent before the power of a mighty God but rather is a person who has integrity and the power to choose and whose integrity and choice are respected by God. In telling us this story of the annunciation, Luke is making a profound theological statement about the relationship between God and humanity, and the essence of that relationship is revealed as partnership. Or, what in theological language has been called synergy. We might sum it up this way: the work of God in the world is accomplished through a freely chosen partnership between God and human beings. It is important to note that the Roman Catholic doctrine that eventually arose that declared Mary to be without personal sin came along a very long time after Luke’s story. Early Christians never held such notions of Mary, and the Eastern Christian churches (the Orthodox churches) have always been highly critical of that particular development. Why? Because it removes Mary from the body of humanity, it makes her into some kind of aberration and it implies that a “normal” human being could not have done what Mary did. Luke, I feel certain, would not have liked that idea of Mary being sinless because it would weaken considerably the statement I think he was seeking to make: that if Mary could choose partnership with God to accomplish the work of bringing Jesus into the world, then any one of us can choose partnership with God to bring Christ into the world in our own particular way, according to our own particular calling. As we celebrate Christmas this year, we might ask ourselves, “What is God inviting me into? How might I give birth to Christ anew in my heart? How might I be invited to be Christ’s hands and heart in the world?” For, like Mary, we have a royal vocation: to become God’s partners in the on-going work of healing humanity and the rest of creation. May Christmas be to you a blessing this year and an opportunity for you to renew your vocation as a bearer of Christ. Recently, I read a small piece in which someone was describing the virtues of his particular stream of the Christian tradition. Among the virtues he named was that his particular band of Christians were aware of their own “wretchedness” – which apparently makes them more aware of how merciful God is. Presumably because God cares about people (or, at least, this particular group of people) in spite of the afore-mentioned wretchedness. Reading this reminded me of a sad legacy of much of Western Christian theology of the last few centuries that encouraged people to view themselves as, quite literally, wretched sinners who ultimately could not overcome their own wretchedness and whose only hope was that Jesus had agreed to save them despite themselves. It is a theological perspective that ultimately leaves human beings in a dismal state, a state that God, in his mercy, is willing to overlook. It is a theology that suggests to me that Jesus pretty much has to hold his nose in order to be in our presence. It is impressive how deeply this perspective has permeated both the internal understanding of Christianity and the external image of our faith. We have generations of Christians who understand humility in terms of being aware of how wretched they are and who believe that to take pride in one’s self serves only to feed the ego and lead us into further wretchedness. I find this perspective difficult to reconcile with the Jesus of the Gospels, especially when I consider my own experience as a human being and, specifically, as a parent. It is clear from all four of the Gospels that Jesus does not feel any need to hold his nose in our presence. In fact, Jesus embraced those whom his society considered wretched with a powerful and enthusiastic love. It seems to me that his message to those people was not, “You know, you all are really horrible people, and there’s really nothing you can do about it, but, hey, God is willing to rescue you (but that whole wretched thing isn’t going to go away, because that’s what you are).” On the contrary, Jesus’ message to these folks was how valuable they were, despite what their society told them. Certainly, they were not perfect (who is?). But the fundamental nature of their humanity was not wretchedness but infinite value and worth. And, indeed, it is this very message that I would want to instill in my own children. While I certainly acknowledge their mistakes, I would never want them to see themselves primarily in terms of their mistakes or dysfunctions. I want them to be able to look past that and see their own value and worth. Far from being fundamentally wretched, they are fundamentally glorious. It would be hard to imagine anyone wanting to raise their children to think of themselves in any other way. So if this is how we would wish our own children to think of themselves, then why would we imagine that God would want us to think of ourselves any differently? If we went about encouraging our children to think of themselves as fundamentally wretched and to think of their parents as tolerating them and being willing to care for them despite their wretchedness, those children would grow up with serious issues with respect to their mental and emotional health. To promote such an image of God has led to a great many issues among a great many people with respect to their spiritual health. In John’s Gospel, God is defined in the simplest way: God is love. Love does not behold the beloved as wretched. Love does not merely tolerate others. Love sees the beloved in the best possible light and desires – passionately desires! – the best for the beloved. This is the love that God practices in Jesus. It is the love that we aspire to practice and to experience in our own relationships. To imagine that God aspires to anything less is simply wrong. Recently, I was introduced to the theology of James Alison, a Roman Catholic priest and theologian whose theological work builds on the thought of philosopher Rene Girard. I can’t possibly do justice to Alison’s work in this short blog post, and, indeed, I am still in the process of understanding his thought myself. But I would like to raise up one aspect of his thought that I am finding resonates with me quite deeply. It begins with the idea that human consciousness is fundamentally structured by violence. This shows itself in the way in which we define ourselves over against other human beings. This leads us to create victims, for in defining ourselves over against others we necessarily come to see those others as less than ourselves in some important way. In perhaps its least destructive form, we victimize others by looking down on them, by belittling them in some way, by saying to at least ourselves (and probably to others, as well) that they are somehow less than we are. In its most destructive form, we assign blame to others as a way of strengthening our own identities. Or, as a way of bringing peace or unity to our community. So, for example, when our society is being pressured by economic, social and political problems, we might seek to create unity and release that pressure by blaming immigrants or Muslims or liberals or conservatives; in other words, by designating a victim. This victimization might even result in a violent acting out against the victim(s). What is particularly interesting to me in Alison’s work is that he suggests that our consciousness is so profoundly formed in violence – that our need and tendency to victimize others (as I’ve tried to describe above) is so deeply rooted – that we tend to view God from this same perspective, and so we talk about God as also defining God’s self over against others, and we image God as One who (like us) makes victims of others. This way of seeing God is found often in the Hebrew Bible and, to a lesser degree, in parts of the New Testament, as well. As I understand him, Alison suggests that this is a misunderstanding of God; for in truth, God is not the One who makes victims, as we do; rather, God is really to be identified with the victim. And this is a truth that is revealed in Jesus, who comes into the world as God within a human life and who becomes a victim of Roman imperial power with involvement from the Jewish religious leadership of the time. The crucifixion is an icon of the way in which human beings victimize and is also an icon of God as victim rather than God as the One who makes others into victims. The startling thing is that, in the wake of Jesus’ death as a victim, comes the Resurrection, in which the victim-Christ is encountered not as the one who wants to exact vengeance from those who made him a victim (which is what our human consciousness, formed by violence, would expect) but rather as the forgiving victim. And this is a revelation of who God truly is. When we turn to the Bible from this perspective, we realize that all of those stories of God smiting others and exacting revenge on the enemies of God and God’s people are there not to show us who God is but rather to show us what God appears to be through the lens of our humanity distorted by violence. Jesus embodies a shifting of the lens, allowing us to see God as the victim rather than the bully or the tyrant. This insight has the power to lead us into a new consciousness formed in the love of the forgiving victim. I won’t presume to have presented James Alison’s theology flawlessly. I have simplified it quite a bit, and I don’t pretend to have yet understood it fully. But already I see in it a frame that opens onto a deeper and more profound appreciation of the Christian faith. His book, The Joy of Being Wrong is based on his doctoral thesis and presents the foundation of this thought. It’s not easy reading but well worth the effort. He is truly shedding anew light on who we are, on who God is and on what the Christian life and journey are really about. In 2012, he will have a new resource, including both text and DVD, called The Forgiving Victim, which seeks to present the Christian faith to adults in a new way.